THE NORFOLK BROADS CRUISE 2013. (Above) Day One: first launching from the wide grassy area at Waveney Centre, sunshine and a light NW breeze. (Below) Heading off up the Waveney towards Beccles, flotilla cruising with a favourable wind. Above: lunch half way to Beccles The first lesson... the slow sections through wind shadows in the narrow river will be slow, so that the team decided to return and go to downstream to Oulton Broad, against the tide starting to come up the river...second lesson: it is not possible to progress beating against the tidal stream. So first outings for the engines (carried on two boats, Alastair's 2.0 horsepower on a bracket sitting on the rudder pintles, and Chris' 3.5 HP on the aft beam) and the next lesson... the engines will hopefully not be needed, but when they are, they need to be fully prepared and fully fuelled! The team struggled back to base (aided by a friendly passing cruiser, so the team had to stop disparaging Gin Palaces) and then headed off down the Waveney to Oulton Broad. Above: easy afternoon cruising, down the Waveney, and about to turn right up to Oulton Broad. 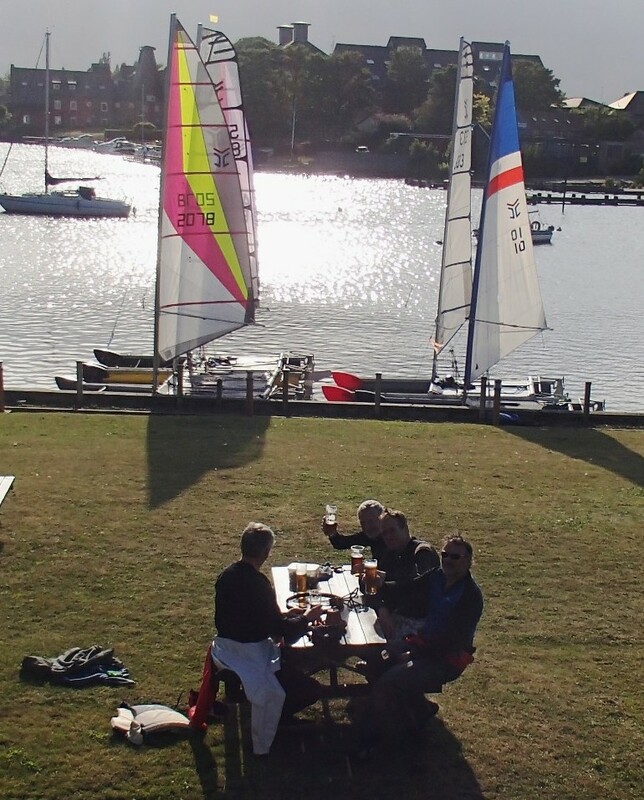 Right: the ideal mooring place at the head of Oulton Broad, and a pub with a view in the evening. The Catapults were noticed as exotic visitors, and a friendly native made contact as we sat---a social contact that would prove vital as the weekend unfolded.